Oral health services for persons with disabilities are among the most prevalent unmet needs in the United States. Little City understands that a dental office can be particularly challenging if the entire experience is not specifically designed to accommodate individuals with special needs. Few practitioners are trained, willing or appropriately equipped to serve individuals with disabilities. Little City’s goal of meeting this need is achieved through the Oral Health and Community Outreach Program. 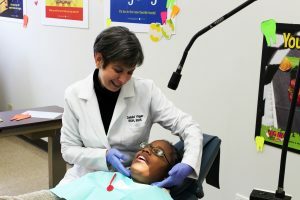 With funding from the Washington Square Health Foundation, Little City expanded its Oral Health and Community Outreach Program to include a 13-step process teaching desensitization to dental hygiene students at Harper College, “sister” agencies, community participants and Little City’s own participants. The goal was, and remains, for those with developmental disabilities to increase their comfort in the dental chair. With guidance from the program’s coordinator, Debbi Viger, RDH, BHS, each participant practices until they can comfortably recline in the dental chair for 15 minutes and tolerate a simulated dental exam complete with light, gloves, mirror and protective eye wear. Program staff have included the use of a lead apron and dental radiographs to help transition program participants to a dental appointment. The results are showing a significant increase in compliance and a decrease in sedation for routine dental appointments. By partnering with community and sister agencies to teach proper daily oral hygiene and nutrition for dental health, Little City staff have seen an overall reduction in plaque and bleeding. The Oral Health and Community Outreach Program uses a combination of in-person training sessions, visual aids, a dental tool box, and a series of specially created videos. For more than 55 years, Little City has developed innovative and personalized programs to fully assist and empower individuals with autism and other intellectual and developmental disabilities. With a commitment to attaining a greater quality of life for hundreds of children and adults, Little City actively promotes choice, person-centered planning and a holistic approach to health and wellness. The organization is located on a therapeutic, 56-acre campus in Palatine and has offices in Schaumburg and Chicago. For more information, visit www.littlecity.org.